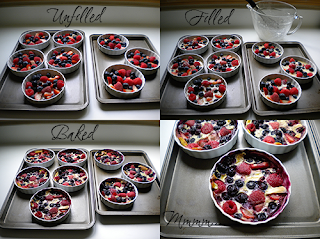 For a recent invitiation we received to a friends' summer cookout, I decided to bring a dessert (since well, I love to make desserts). Most of the time, I try to find someone different and unique or at least something I haven't seen brought to other gatherings. I am a die-hard Betty Crocker fan but this time, I checked out Better Homes and Gardens online to search their recipes. Rush home, start preparations. Cut up fruit, arrange in dishes (easy enough). Make the "cake" batter (hmm..didn't get fat-free milk..oh just use what I have). Fill the dishes and bake (cooking time is short -good). Out of the oven they emerge. Mmmmm..looks tasty...might be a little short on the berries....and probably should have made another batch of batter since the recipe served 6 and I needed 8 dishes. Lesson learned. End result. 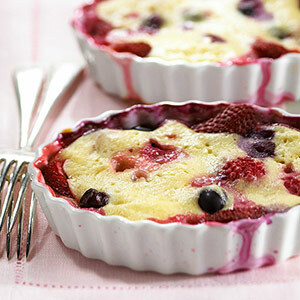 They were a little "flat" because of the lack of berries and batter, but overall, pretty tasty and the perfect summer dessert! Will definately try these again. It should come as no surprise that I'm completely mesmerized by our new Island Treasures Summer Jewelry Collection featuring CrystallizedTM Swarovski Elements Starfish. Although originally designed for everyday summer fashions, I quickly realized that all three crystal colors would also pair perfectly with a summer wedding. So I got to work building a jewelry inspiration board that would make any bride weep with joy. Although I was a winter bride and loved my winter wedding (held just three days before Christmas). Just about a month before our wedding we took a trip to Sanibel Island. IF for some reason, my winter wedding was not doable, I definitely would have considered a beach wedding, right on Sanibel Island. The pieces of jewelry shown above are the Blue Crystal Starfish Charm Floating Circles Bracelet (B178-IN) and MOP Shell Circles Blue Starfish Crystal Necklace (N100). The layers of the wedding dress featured, by Brides.com, reminded me of waves on the ocean, rolling towards the beach. Ironically, just a few weeks ago, I purchased a pair of bronze jewel encrusted sandals from Dress Barn (love 'em!). After wearing them I thought, 'gee...these would be perfect for a beach wedding' (in white of course!). So if you're having a beach wedding or destination wedding, why bother with the formality of a wedding shoe -wear a wedding sandal! 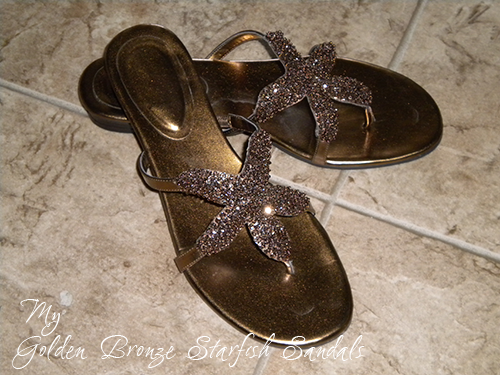 Featured in the set above are a pair of women's starfish beaded sandals by Cocobelle. 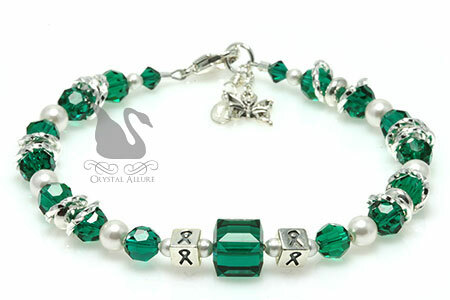 Crystal Allure presents a new line of beaded awareness bracelets added to the Awareness Jewelry Collection in support of Pulmonary Fibrosis (PF). Back in 2006, I had been in communication with Jennifer Bulandr about creating a one-of-a-kind beaded awareness bracelet in support of pulmonary fibrosis. 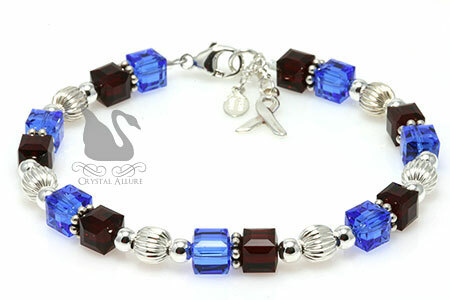 From out of the studio came a beautiful, sparkling red and blue Swarovski Crystal bracelet complete with awareness ribbon charm. It quickly sold out. 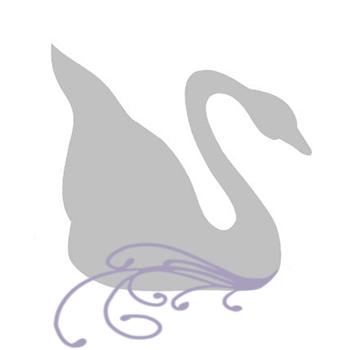 With all the changes going on here, it has been a banner year for Crystal Allure. To celebrate, I have re-introduced the original Pulmonary Fibrosis awareness bracelet only this time the design reflects a more feminine flair for a look that is both beautiful and chic! As with all our awareness bracelet designs, we incorporate the colors of the cause -NOT the colors of the charity that represents/supports the cause. This is a key feature of our designs -your purchase supports the cause. And Crystal Allure will donate a portion of the net proceeds to programs that support pulmonary fibrosis research and awareness. 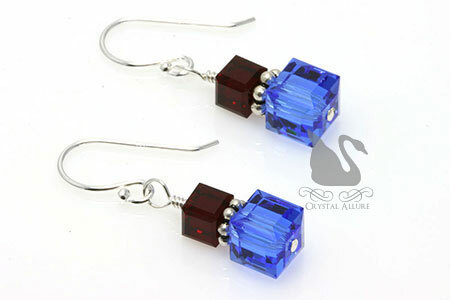 Why not also pick up the matching crystal earrings for a perfect set. The matching handcrafted beaded awareness earrings feature gorgeous red and blue Swarovski Crystals, sterling silver Bali and are finished with a sterling silver ear wires. Length is 1/2" from the bottom of the ear wire. Combining both red and blue colors, symbolizing the oxygenated and unoxygenated blood going to the lungs, is a signature of our Pulmonary Fibrosis designer awareness earrings. Why red and blue? Read about why red and blue symbolize pulmonary fibrosis.